The way people interact with our coastline is diverse, and creates the opportunity for some interesting conversations. Recreational uses, such as swimming, surfing, walking, boating, fishing and surf life saving. Coastal development such as residential housing and marina developments. Shipping and the transport industry. There may be some more obscure uses brought up in discussions, such as using sand to make glass. These are all valid uses of our coastline, some positive and some negative. From your discussions, identify the positive and the negative interactions with the beach. Can a negative interaction also be a positive? For example, by building a marina, the development impacts on the natural habitat of the area. However, it also creates a new habitat for marine life on the rock walls and jetty pylons, and a sheltered area where juvenile fish can seek refuge. 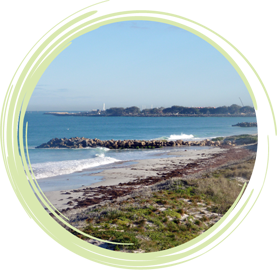 Complete your discussions by identifying ways that you can reduce your negative interactions on the coastal environment.